Successfully Added HK Warehouse Blackview A9 Pro Android Phone - 4G, 2GB RAM, Quad Core CPU, Dual Rear Camera, Android 7.0, 5 Inch Display (White) to your Shopping Cart. The 5.5 inch A9 Pro from Black view with its HD resolutions, Quad-core CPU and 2GB of RAM brings some great mid-range features at cheap phone prices. At 294ppi pixel density the 5-inch screen won't disappoint when it comes to games or movies. With good color reproduction, nice contrasts and sharp details all your media and games can be fully enjoyed. Equipped with a quad core MediaTek CUP clocked at 1.3Ghz and sporting 2GB of RAM the Blackview A9 Pro promises a lag free performance for multitasking an should handle most smarphone games with minimal effort. the Phone has 16GB of onboard storage and the micro SD card slot offers a chance to expand this with a further 32GB of memory. This should be more than enough for a full media library of music and films with plenty left over for games and phtoos. If you like movies or viewing the sports highlights then you'll be pleased to learn this android phone supports 4G connectivity. This provides fast and stable data connectivity on the go so you'll be abel to browse the web, stream movies or watch live sports updates without any lag or stutter. When it comes to snapping images the A9 Pro smartphone boasts a ear dual camera setup that combines two Samsung sensors that together bring high quality photography capabilities to this cheap phone. You'll now be able to enjoy clear images in vivid details whether snapping photos or shooting video. The Android 7.0 Nougat OS is the cherry on the top for this phone. It combines all the best features for an intuitive user experience and is sure to wow users with its array of functions. 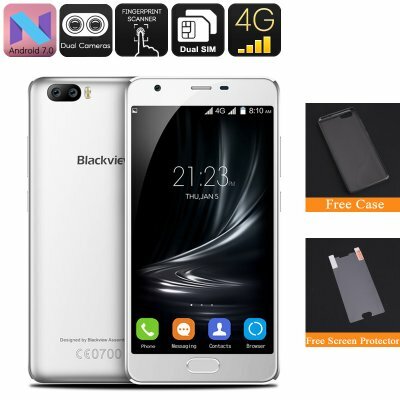 The Blackview A9 Pro Android phone comes with 12 months warranty, brought to you by the leader in electronic devices as well as android smartphones and cell phone accessories..